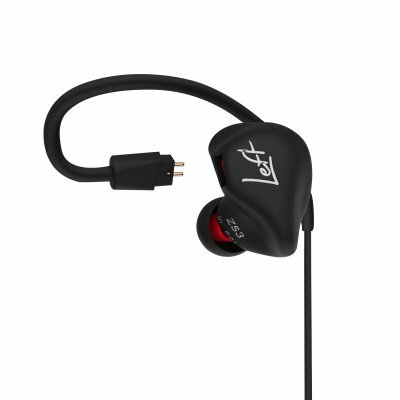 Successfully Added KZ ZS3 Sports Earphone - Noice Isolating, Microphone, Ear Hook, Removable Audio Cord to your Shopping Cart. Finding the right audio gear that can deliver top notch audio quality can leave an enormous dent in your wallet nowadays as quality audiophile grade hardware tends to come with a hefty price tag. Luckily there are nowadays a lot of cheaper options available that do still deliver the best audio quality imaginable. The KZ ZS3 headphone is known for delivering a high quality audio experience and comes along with a range of cool features which any budget audiophile would be expecting to pay a lot more for. Its high performance and noise isolating ear tips allow you to enjoy your music where ever you go. Canceling outside noise ranging up to 26dB the KZ ZS3 earphones allow you to listen all your tracks on a lower volume as you no longer have to be afraid of getting distracted by your noisy surroundings. Not only does this guarantee an amazing audio experience, it also protects your hearing as no longer you need to turn up the volume to enjoy your music to the most. With its built-in ear hook that has been fitted into the cable itself, the KZ ZS3 earphone is guaranteed to offer a comfortable fit to any ear. The earphones furthermore come along with two extra pair of ear tips in different sizes to ensure that, no matter your ear size, the KZ SZ3 headphones will fit perfectly. Due to its comfortable and well fitting design these headphones offer the perfect way to listen to music not only at home or on the go but also while working out. Whether you practice Yoga, pump iron, or hit the streets for a jog; these KZ ZS3 headphones are ought to deliver a top quality audio experience. The KZ ZS3 has a gorgeous design - making it not only a feast to listen to music through these epic headphones - but also beautiful to the eye. Its removable cable features a built-in high quality microphone and miniature remote control, allowing you to swiftly switch in between songs and incoming phone calls. For those of you who are looking for a product that is both appealing to the eye and can deliver outstanding audio quality – the KZ ZS3 headphones are the ultimate choice. These Earphones come with a 12 months warranty, brought to you by the leader in electronic devices as well as wholesale gadgets..
Arabic - سماعات بلوتوث; Chinese Simplified - 蓝牙耳机; Czech - Bluetooth sluchátka; Danish - Bluetooth hovedtelefon; Dutch - Bluetooth koptelefoon; French - Écouteurs Bluetooth; German - Bluetooth-Kopfhörer; Greek - Ακουστικά Bluetooth; Hindi - ब्लूटूथ इयरफ़ोन; Indonesian - Bluetooth earphone; Italian - Auricolari Bluetooth; Japanese - ブルートゥース イヤホン; Korean - 블루투스 이어폰; Norwegian - Bluetooth-hodetelefoner; Polish - Słuchawki Bluetooth; Portuguese - Fones de ouvido Bluetooth; Russian - Bluetooth наушники; Spanish - Auriculares Bluetooth; Thai - หูฟังบลูทูธ.